Popular Grove Pointe family friendly neighborhood. 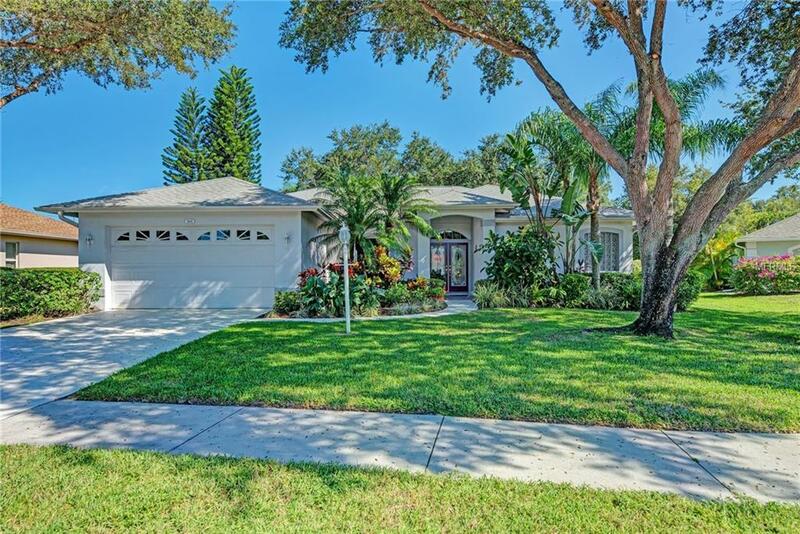 Beautifully maintained 3 bedroom, 2 bath pool home with lush landscaping located in "A" rated school district for Ashton Elementary, Sarasota Middle and Riverview High School. You will enjoy how light and bright this home shows with soaring cathedral ceilings, open kitchen with island opening to the family room. Kitchen counter tops are quartz. Breakfast nook with seamless glass overlooking the pool. The dining room and living room areas are great for entertaining. Upgrades include newer roof, ac, water heater, pool pump and carpet. Home has hurricane window shutters, generator and generator hookup . Well for irrigation. HOA fees are only $395/ year. The neighborhood is 12 minutes from Siesta Key Beach, 10 minutes from Riverview High and minutes from Home Depot, Walmart, shopping and restaurants and is convenient to both Bee Ridge and Clark Rd exits for I- 75. This is a great house to call home! Additional Lease Restrictions Call Argus Management For Additional information. No Air & B Rentals Nor Businesses Operated Out Of Your Home in The Neighborhood.